Paul Klee (18 December 1879 - 29 June 1940) was born in Munchenbuchsee, Switzerland, and is considered both a German and a Swiss] painter. His highly individual style was influenced by movements in art that included expressionism, cubism, and surrealism. He was also a student of orientalism. Klee was a natural draftsman who experimented with and eventually mastered colour theory, and wrote extensively about it; his lectures Writings on Form and Design Theory (Schriften zur Form und Gestaltungslehre), published in English as the Paul Klee Notebooks, are considered so important for modern art that they are compared to the importance that Leonardo da Vinci's A Treatise on Painting had for Renaissance. He and his colleague, the Russian painter Wassily Kandinsky, both taught at the German Bauhaus school of art, design and architecture. His works reflect his dry humor and his sometimes childlike perspective, his personal moods and beliefs, and his musicality. 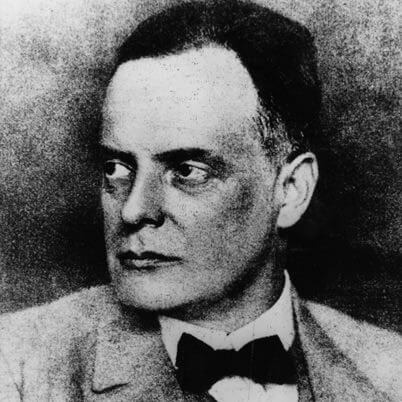 Paul Klee was born as the second child of the German music teacher Hans Wilhelm Klee (1849-1940) and the Swiss singer Ida Marie Klee, nee Frick (1855-1921). His sister Mathilde (died 6 December 1953) was born on 28 January 1876 in Walzenhausen. Their father came from Tann and studied at the Stuttgart Conservatory singing, piano, organ and violin, where he met his future wife Ida Frick. Until 1931 Hans Wilhelm Klee was active as a music teacher at the Bern State Seminary in Hofwil near Bern. Due to this circumstances, Klee was able to develop his music skills through his parental home; his parents backed and inspired him until his death. In 1880, his family moved to Bern, where they moved 17 years later after numerous changes of residence into a house at the Kirchenfeld district. From 1886 to 1890, Klee visited the primary school and received, at the age of 7, violin classes at the Municipal Music School. He was so talented on violin that, aged 11, he received an invitation to play as an exceptional member of the Bern Music Association. In his early years, following his parent's wishes, he focused on becoming a musician; but he decided on the visual arts during his teen years, partly out of rebellion and partly because of a belief that modern music lacked meaning for him. He stated, "I didn't find the idea of going in for music creatively particularly attractive in view of the decline in the history of musical achievement." As a musician, he played and felt emotionally bound to traditional works of the eighteenth and nineteenth century, but as an artist he craved the freedom to explore radical ideas and styles. At sixteen, Klee's landscape drawings already show considerable skill. Around 1897, he started his diary, which he kept until 1918, and which has provided scholars with valuable insight into his life and thinking. During his school years, he avidly drew in his school books, in particular drawing caricatures, and already demonstrating skill with line and volume. He barely passed his final exams at the "Gymnasium" of Bern, where he qualified in the Humanities. With his characteristic dry wit, he wrote, "After all, it's rather difficult to achieve the exact minimum, and it involves risks." 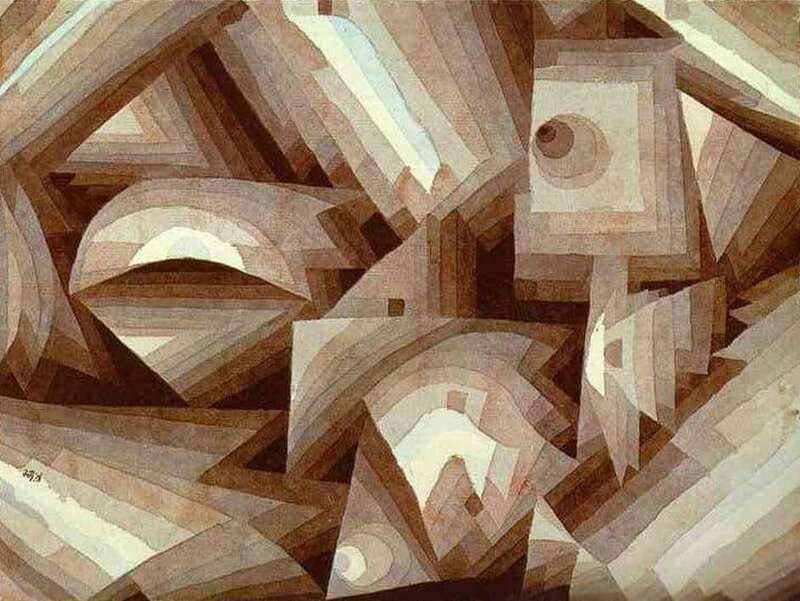 On his own time, in addition to his deep interests in music and art, Klee was a great reader of literature, and later a writer on art theory and aesthetics. With his parents' reluctant permission, in 1898 he began studying art at the Academy of Fine Arts in Munich with Heinrich Knirr and Franz von Stuck. He excelled at drawing but seemed to lack any natural color sense. He later recalled, "During the third winter I even realized that I probably would never learn to paint." During these times of youthful adventure, Klee spent much time in pubs and had affairs with lower class women and artists' models. He had an illegitimate son in 1900 who died several weeks after birth. After receiving his Fine Arts degree, Klee went to Italy from October 1901 to May 1902 with friend Hermann Haller. They stayed in Rome, Florence, and Naples, and studied the master painters of past centuries. He exclaimed, "The Forum and the Vatican have spoken to me. Humanism wants to suffocate me." He responded to the colors of Italy, but sadly noted, "that a long struggle lies in store for me in this field of color." For Klee, color represented the optimism and nobility in art, and a hoped for relief from the pessimistic nature he expressed in his black-and-white grotesques and satires. Returning to Bern, he lived with his parents for several years, and took occasional art classes. By 1905, he was developing some experimental techniques, including drawing with a needle on a blackened pane of glass, resulting in fifty-seven works including his Portrait of My Father (1906). In the years 1903-5 he also completed a cycle of eleven zinc-plate etchings called Inventions, his first exhibited works, in which he illustrated several grotesque characters. He commented, "though I'm fairly satisfied with my etchings I can't go on like this. I'm not a specialist." 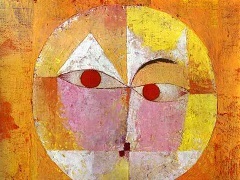 Klee was still dividing his time with music, playing the violin in an orchestra and writing concert and theater reviews. In January 1911 Alfred Kubin met Klee in Munich encouraging him to illustrate Voltaires Candide. Around this time, Klee's graphical work saw an increase, and his early inclination towards the absurd and the sarcastic was well received by Kubin. He did not only befriend Klee but he was also one of his first significant collectors. Klee met, through Kubin, the art critic Wilhelm Hausenstein in 1911, and was in the summer that year foundation member and manager of the Munich artists' union Sema. In autumn he made an acquaintance with August Macke and Wassily Kandinsky, and in winter he joined the editorial team of the almanach Der Blaue Reiter, founded by Franz Marc and Kandinsky. 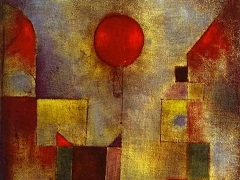 On meeting Kandinsky, Klee recorded, "I came to feel a deep trust in him. He is somebody, and has an exceptionally beautiful and lucid mind." Other members including Macke, Gabriele Munter and Marianne von Werefkin. Klee progressed in a few months of his assistance to one of the most important and independent members of the Blaue Reiter, but he was not yet fully integrated. The release of the almanach was delayed for the benefit of an exhibition. The first Blaue Reiter exhibition took place from 18 December 1911 to 1 January 1912 in the Moderne Galerie Heinrich Thannhauser in Munich. Klee did not attend it, but in the second exhibition, occurred from 12 February to 18 March 1912 in the Galerie Goltz, 17 of his graphical works were showed. The name of this art exhibition was Schwarz-Weiß, as it only regarded graphic painting. Initially planned to be released in 1911, the release date of the Der Blau Reiter almanach by Kandinsky and Marc was delayed in May 1912, including the reproducted ink drawing Steinhauer by Klee. At the same time, Kandinsky published his art history writing Uber das Geistige in der Kunst. The association opened his mind to modern theories of color. His travels to Paris in 1912 also exposed him to the ferment of Cubism and the pioneering examples of "pure painting", an early term for abstract art. The use of bold color by Robert Delaunayand Maurice de Vlaminck also inspired him. Rather than copy these artists, Klee began working out his own color experiments in pale watercolors and did some primitive landscapes, including In the Quarry (1913) and Houses near the Gravel Pit(1913), using blocks of color with limited overlap. Klee acknowledged that "a long struggle lies in store for me in this field of color" in order to reach his "distant noble aim." Soon, he discovered "the style which connects drawing and the realm of color." While Klee was in Paris, he was able to access Post-Impresionism works of Paul Cezane and Vincent van Gogh. "Permit me to be scared stiff," Klee said after seeing van Gogh's paintings. Van Gogh influenced Klee's use of color to express emotion, his simplified or distorted drawing, and his sacrifice of realistic illusions of depth to an emphatic surface pattern. Kleee's artistic breakthrough came in 1914 when he briefly visited Tunisia with August Macke and Louis Moilliet and was impressed by the quality of the light there. He wrote, "Colour has taken possession of me; no longer do I have to chase after it, I know that it has hold of me forever... Colour and I are one. I am a painter." With that realization, faithfulness to nature fades in importance. 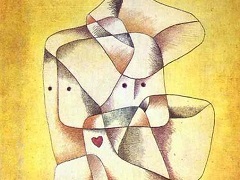 Instead, Klee began to delve into the "cool romanticism of abstraction". In gaining a second artistic vocabulary, Klee added color to his abilities in draftsmanship, and in many works combined them successfully, as he did in one series he called "operatic paintings". One of the most literal examples of this new synthesis is The Bavarian Don Giovanni (1919). A few weeks later, World War I began. At first, Klee was somewhat detached from it, as he wrote ironically, "I have long had this war in me. That is why, inwardly, it is none of my concern." Soon, however, it began to affect him. His friends Macke and Marc both died in battle. Venting his distress, he created several pen and ink lithographs on war themes including Death for the Idea (1915). He also continued with abstracts and semi-abstracts. 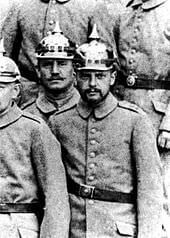 In 1916, he joined the German war effort, but with behind the scenes maneuvering by his father, Klee was spared serving at the front and ended up painting camouflage on airplanes and working as a clerk. He continued to paint during the entire war and managed to exhibit in several shows. By 1917, Kleee's work was selling well and art critics acclaimed him as the best of the new German artists. His Ab ovo (1917) is particularly noteworthy for its sophisticated technique. It employs watercolor on gauze and paper with a chalk ground, which produces a rich texture of triangular, circular, and crescent patterns. Demonstrating his range of exploration, mixing color and line, his Warning of the Ships(1918) is a colored drawing filled with symbolic images on a field of suppressed color. In 1919, Klee applied for a teaching post at the Academy of Art in Dusseldorf. 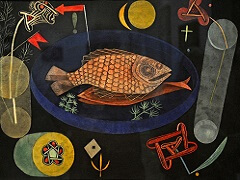 This attempt failed but he had a major success in securing a three-year contract (with a minimum annual income) with dealer Hans Goltz, whose influential gallery gave Klee major exposure, and some commercial success. A retrospective of over 300 works in 1920 was also notable. 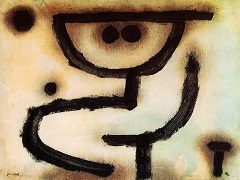 Klee taught at the Bauhaus from January, 1921 to April, 1931. He was a "Form" master in the bookbinding, stained glass, and mural painting workshops and was provided with two studios. In 1922, Kandinsky joined the staff and resumed his friendship with Klee. Later that year the first Bauhaus exhibition and festival was held, for which Klee created several of the advertising materials. And in the same year, the first series of Bauhaus books is published with works by Gropius (International Architecture), Paul Klee, Adolf Meyer, Oskar Schlemmer, and Piet Mondrian. Klee welcomed that there were many conflicting theories and opinions within the Bauhaus: "I also approve of these forces competing one with the other if the result is achievement." Klee was also a member of Die Blaue Vier (The Blue Four), with Kandinsky, Feininger, and Jawlensky; formed in 1923, they lectured and exhibited together in the USA in 1925. That same year, Klee had his first exhibits in Paris, and he became a hit with the French Surrealists. Klee visited Egypt in 1928, which impressed him less than Tunisia. In 1929, the first major monograph on Klee's work was published, written by Will Grohmann. Klee also taught at the Dusseldorf Academy from 1931 to 1933, and was singled out by a Nazi newspaper, "Then that great fellow Klee comes onto the scene, already famed as a Bauhaus teacher in Dessau. He tells everyone he's a thoroughbred Arab, but he's a typical Galician Jew." His home was searched by the Gestapo and he was fired from his job. His self-portrait Struck from the List(1933) commemorates the sad occasion. In 1933-4, Klee had shows in London and Paris, and finally met Pablo Picasso, whom he greatly admired. 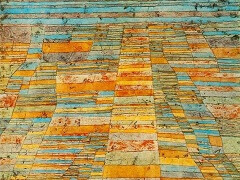 The Klee family emigrated to Switzerland in late 1933. 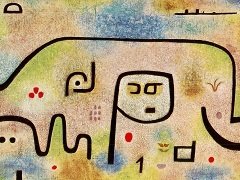 Klee was at the peak of his creative output. His Ad Parnassum (1932) is considered his masterpiece and the best example of his pointillist style; it is also one of his largest, most finely worked paintings. He produced nearly 500 works in 1933 during his last year in Germany. 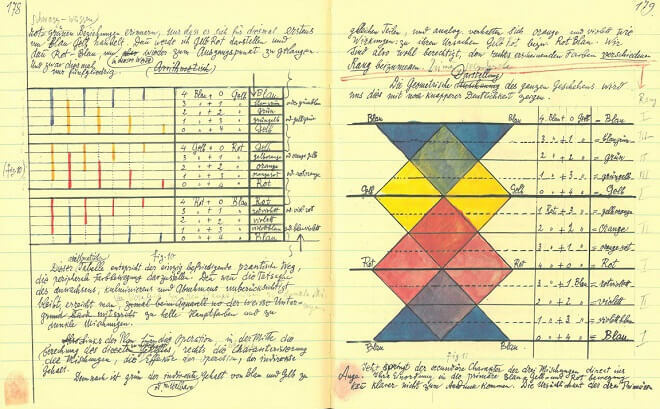 However, in 1933, Klee began experiencing the symptoms of what was diagnosed as scleroderma after his death. The progression of his fatal disease, which made swallowing very difficult, can be followed through the art he created in his last years. His output in 1936 was only 25 pictures. In the later 1930s, his health recovered somewhat and he was encouraged by a visit from Kandinsky and Picasso. Klee's simpler and larger designs enabled him to keep up his output in his final years, and in 1939 he created over 1,200 works, a career high for one year. He used heavier lines and mainly geometric forms with fewer but larger blocks of color. His varied color palettes, some with bright colors and others sober, perhaps reflected his alternating moods of optimism and pessimism. Back in Germany in 1937, when Nazis took control of the government, seventeen of Klee's pictures, along with other works of contemporary avant-garde artists, such as Marc Chagall, Max Ernst, Piet Mondrian, and Wassily Kandinsky, were included in an exhibition of "Degenerate art" and 102 of his works in public collections were seized by the Nazis. Klee suffered from a wasting disease, scleroderma, toward the end of his life, enduring pain that seems to be reflected in his last works of art. One of his last paintings, "Death and Fire", features a skull in the center with the German word for death, "Tod", appearing in the face. He died in Muralto, Locarno, Switzerland, on 29 June 1940 without having obtained Swiss citizenship, despite his birth in that country. His art work was considered too revolutionary, even degenerate, by the Swiss authorities, but eventually they accepted his request six days after his death. His legacy comprises about 9,000 works of art. The words on his tombstone, Klee's credo, placed there by his son Felix, say, "I cannot be grasped in the here and now, For my dwelling place is as much among the dead, As the yet unborn, Slightly closer to the heart of creation than usual, But still not close enough." He was buried at Schosshaldenfriedhof, Bern, Switzerland.